On March 14, 2016 Business Development staff presented an Economic Development Update to the City Council, providing an overview of recent economic activity and trends, as well as the impact of ongoing and future developments in San Leandro. The update looked at how economic factors have changed, and in most cases improved, since the depths of the recession in 2010. This is the second in a series of three posts designed to provide a snapshot of San Leandro’s current economic status. Click on the images to see enlarged versions. This post examines changes in the commercial real estate market, as measured by the vacancy rate and rental rate. Vacancy rate is the percentage of total building space in a sector that is unoccupied at a given time. Rental rate is the number of dollars per square foot of building space that tenants pay per year. As demand for commercial buildings increases, the vacancy rate generally decreases and rental rate increases. This trend can bring greater investment in local buildings and improvement in the quality of businesses and jobs in the area. NOTE: Vacancy rate is shown in blue, with percentages marked on the left side of the graph. Rental rate is shown in red, with dollar amounts marked on the right side of the graph. Warehouses are a large part of San Leandro’s commercial building stock, with around 16.5 million square feet of space in the City. However, very little of that space is currently available for rent or sale. 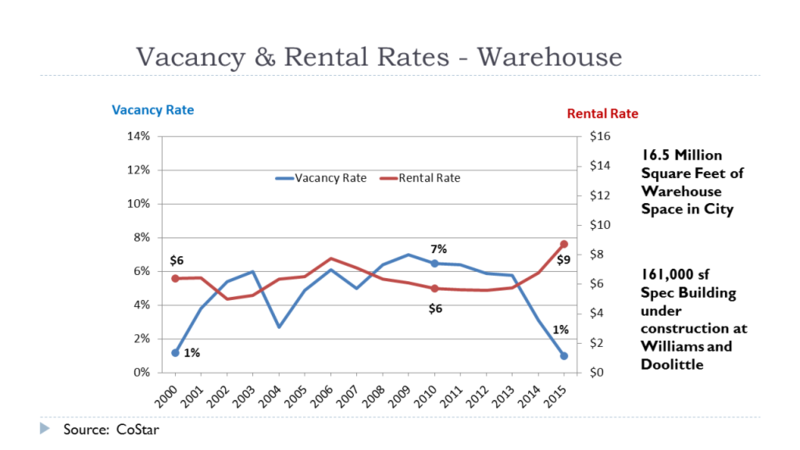 The warehouse vacancy rate is around 1%, down from a 7% vacancy rate in 2010. As less space is available, the price to rent that space is increasing, from $6 per square foot per year in 2010 to $9 in 2015. With very low vacancy and high rents, interest in constructing new warehouse space is increasing. San Leandro has around 4 million square feet of manufacturing space. 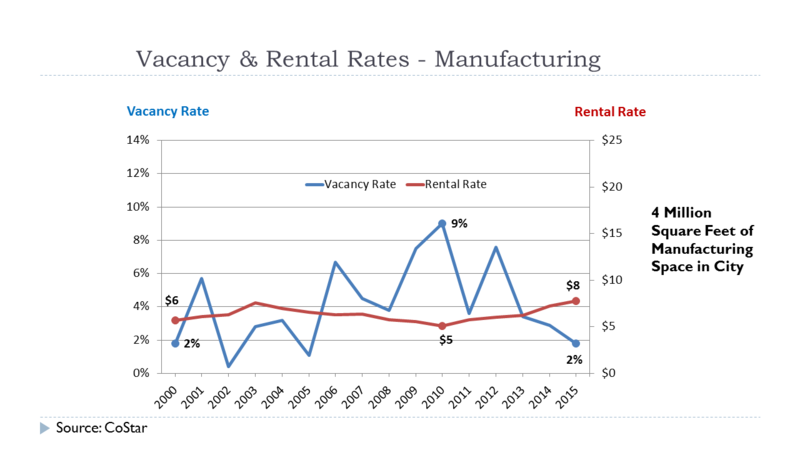 A similar trend of low vacancy rates and higher rents is occurring in the manufacturing market. Vacancy rate has decreased from 9% in 2010 to 2% in 2015. Rental rate has increased from $5 per square foot per year in 2010 to $8 in 2015. There is more fluctuation in the manufacturing vacancy rate because there is less manufacturing space in the local market and the buildings are large. The vacancy of one 150,000 square foot building can have a visible impact on the vacancy rate. San Leandro has around 6 million square feet of retail space. 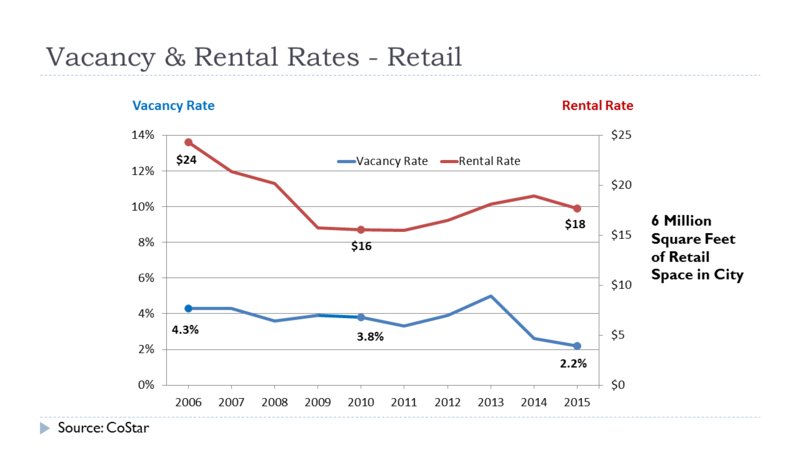 Vacancy rate has decreased from 3.8% in 2010 to 2.2% in 2015. Rental rate has increased from $16 per square foot per year in 2010 to $18 in 2015. While on average the rental rate has not returned to pre-recession levels, rent in new commercial buildings and downtown areas has exceeded the 2006 peak level of $24 per square foot per year. To read the third part in this series, click HERE.